Vanderbilt-bound Summer Dvorak battled her way into the Southern Section singles tennis championship before dropping a 6-2, 6-2 finals match to defending champion Ena Shibahara from D-1 champion Peninsula/Rolling Hills), the nation’s third-ranked high school player this past Monday at the Seal Beach Tennis Center. The Laguna senior earned the finals spot by defeating Peninsula’s No. 2 player, Ryan Peus, 1-6, 7-5, 6-3. Dvorak was down 4-1 in the second set and rallied for the stunning victory. 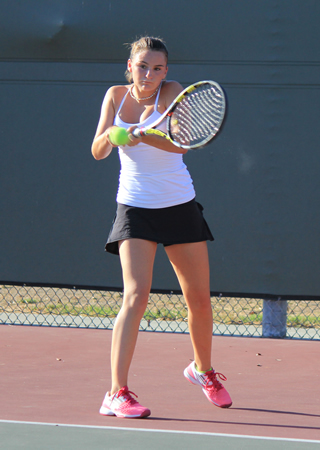 She earned the final four spot by defeating Emily Maxfield from Murrieta Valley 6-2, 6-3. Maxfield had defeated Dvorak in the team D-4 semifinals in a hard fought 6-7 (10-8 tiebreaker) match a few weeks ago. Dvorak had beaten Michelle Hyun (Whitney) 6-0, 6-0, Isabella Lopez (Warren) 6-1, 6-0, and Kelsie Bryant (Carpinteria) 6-7, 6-1, 6-2 before meeting Maxfield. The only other finals appearance ever for the Breaker girls was in 2005 when Claire Rietsch and Lindsay Kinstler won the Southern Section CIF Doubles Championship. The boys team has had six championship match appearances in the individuals with Rick Leach winning in 1983 and Jon Leach in 1988.